The feverishly awaited taper announcement, after months of deafening Fed cacophony, is in the can. The Fed, unless it backtracks again, will cut its purchases of Treasuries and Mortgage Backed Securities by $10 billion in January, and possible every month until it’s done with its money-printing and paper buying binge. The program repressed mortgage rates and inflated the value of MBAs. But mere talk of ending it has sent mortgage rates soaring – and mortgage applications plunging to the “lowest level in more than a dozen years,” lamented the Mortgage Bankers Association. The Refinance Index has crashed. The all-important Purchase Index is now 12% lower than last year. People who need mortgages to buy homes – hence, not hedge funds, private equity firms, oligarchs, and other sundry investors – have been throttling back. Sales of existing homes slumped for the third month in a row in November, down 4.3%, to a seasonally adjusted annual rate of 4.9 million, 1.2% below last year – the first annual decline in over two years. It’s just getting too darn expensive. Home prices have soared over the last two years. And mortgage rates have soared since May. A toxic concoction. The average contract rate for 30-year mortgages with conforming loan balances ($417,000 or less) rose to 4.62%, up from 3.59% in early May. Over a full percentage point. Just on taper talk – though the Fed has continued its bond-buying binge with relentless determination. Where will mortgage rates go when the Fed actually stops trying to repress them? Now comes part three of the debacle, after soaring home prices and mortgage rates. It was drowned out by the hullaballoo over the Fed’s taper announcement. It came from our favorite bailed-out, taxpayer-owned Fannie Mae and Freddie Mac that purchase mortgages from banks and then either keep them on their books or stuff them into MBAs that they sell with some guarantees. Biggest buyer? The Fed. It has been plowing $40 billion a month into them – to be reduced to $35 billion in January. The banks love this system because they get the fat fees from originating the mortgage without having to absorb the risks. The GSEs and the Fed run the show. Banks are involved just enough to cream profits off the transaction. It’s not exactly the paragon of a free market. But there are some efforts underway to encourage private capital to play a larger role. So last week, the Federal Housing Finance Agency announced that it would impose a 10 basis-point increase (1/10th of 1 percentage point) in guaranty fees that Fannie Mae and Freddie Mac charge banks. And now Fannie Mae and Freddie Mac have announced that they would revamp their risk-based matrix of fees that they charge lenders. Lenders roll these fees into the mortgage, which drives up monthly payments. The change will hit borrowers with a so-so credit score who cannot come up with a down payment of at least 20% – hence the majority of all borrowers – the hardest. And with mortgage rates already jumping. Based on the Mortgage Bankers Association’s analysis, guarantee fees – Loan Level Price Adjustments, they’re called – could increase by 0.75 to 1.5 percentage points for borrowers stuck in so-so credit-score purgatory. Half a percentage point! On top of the full percentage point that mortgage rates have already increased, on top of any increase in mortgage rates that might occur as a result of the Fed’s withdrawal from binging on MBAs. That’s the first hint of what might happen when a subsidized industry as housing is being encouraged to try to stand on its own wobbly feet. The Mortgage Bankers Association, which represents banks that have gotten fat by creaming off profits from this subsidized process, is now aggressively lobbying against the change. They want neither the Fed nor the taxpayer to abandon them. Of course, home buyers only have to pay the fees if they want to get the lower mortgage rates that these government guarantees make possible. If they don’t want to pay the fees, they can always pay an even higher rate for a mortgage that is not guaranteed by the GSEs. In either case, owning a home is in the process of getting much more expensive. Each quarter the Fed releases their assessment of the economy along with their forward looking projections for three years into the future. (See Fed Projections Myth Vs. Reality for the September analysis) I started tracking these projections beginning in early 2011 and comparing the Fed's forecasts with what eventually became reality. The problem has, and continues to be, is that their track record for forecasting has been left wanting. The reality is, however, is that the Federal Reserve simply cannot verbally state what they really see during each highly publicized meeting as it would roil the markets. Instead, they use their communications to guide the markets expectations toward reality in the hopes of reducing the risks of market dislocations. The most recent release of the Fed's economic projections on the economy, inflation and unemployment continue to follow the same previous trends of weaker growth, lower inflation and a complete misunderstanding of the real labor market. When it comes to the economy, the Fed has consistently overstated economic strength. Take a look at the chart and table. In January of 2011, the Fed was predicting GDP growth for 2013 at 4.0%. Actual real GDP (inflation adjusted) is currently estimated at 2.0% for the year or a negative 50% difference. The estimates at that time for long run economic growth was 2.7% which has now fallen to 2.15% and was guided down from 2.3% in September and 2.5% in June. We have been stating repeatedly over the last 2 years that we are in for a low growth economy due to the debt deleveraging, deficits and continued fiscal and monetary policies that are retardants for economic prosperity. The simple fact is that when an economy requires more than $5 of debt to provide $1 of economic growth – the engine of growth is broken. As of the latest Fed meeting the forecast for 2014 and 2015 economic growth has been revised down to just 2.9% and 2.8% respectively as the realization of a slow-growth economy is recognized. However, the current annualized trend of GDP suggests growth rates in the next two years could likely be lower than that. With more than 48 months of economic expansion behind us; this current expansion is longer than the historical average. Economic data continues to show signs of weakness, despite intermittent pops of activity, and the global economy remains drag on domestic exports. With higher taxes, government spending cuts and the debt ceiling debate looming the fiscal drag on the economy could be larger than expected. What is very important is the long run outlook of 2.15% economic growth. That rate of growth is not strong enough to achieve the "escape velocity" required to substantially improve the level of incomes and employment that were enjoyed in previous decades. The Fed's new goal of targeting a specific unemployment level to monetary policy could potentially put the Fed into a box. Currently, the Fed sees 2014 unemployment falling to 6.45% and ultimately returning to a 5.6% "full employment" rate in the long run. That long run rate was adjusted higher from the June meeting. The issue with this "full employment" prediction really becomes what the definition of "reality" is. Today, average Americans have begun to question the credibility of the BLS employment reports. Even Congress has made an inquiry into the data collection and analysis methods used to determine employment reports. Since the end of the last recession employment has improved modestly. However, that improvement, as shown in full-time employment to population ratio chart below, has primarily due to increases in temporary and lower wage paying positions. More importantly, where the Fed is concerned, the drop in the unemployment rate has been due to a shrinkage of the labor pool rather than an increase in employment. While the unemployment "rate" is declining, it is a very poor measure from which to benchmark the health of the economy. The drop in unemployment is primarily due to temporary hires, labor hoarding and falling labor participation rates. Real full-time employment as a percentage of the working population shows that employment has only marginally increased since the financial crisis. The drop in jobless claims does not necessarily represent an increasing employment picture but rather labor hoarding by companies after deep levels of employment reductions over the past 4 years. When it comes to inflation, and the Fed's outlook, the debate comes down to what type of inflation you are actually talking about. The table and chart below show the actual versus projected levels of inflation. The Fed significantly underestimated official rates of inflation in 2011. However, in 2012 and 2013 their projections and reality became much more aligned. Unfortunately, inflation has fallen well below target levels of 2% which is weighing on economic growth. The Fed's greatest economic fear is deflation and the current drop in annual rates of inflation will keep pressure on the Fed to continue to accommodative policy active for longer than most expect. However, for the average American the inflation story is entirely different. Reported inflation has little meaning to the consumer as the real cost of living has risen sharply in recent years. Whether it has been the cost of health insurance, school tuition, food, gas or energy – these everyday costs have continued to rise substantially faster than their incomes. This is why personal savings rates continue to fall, and consumer credit has risen, as incomes remain stagnant or weaken. It is the rising "cost of living" that is weighing on the American psyche, and ultimately, on economic growth. While the FOMC is vastly hopeful that the current economic improvement will be sustained; rising deflationary pressures, weak global growth rates and stagnant wages pose major headwinds. The problem is that the current proposed policy is an exercise in wishful thinking. While the Fed blames fiscal policy out of Washington; the reality is that monetary policy does not work in reducing real unemployment or interest rates. However, what monetary policy does do is promote asset bubbles that are dangerous; particularly when they are concentrated in the riskiest of assets from stocks to junk bonds. With the Fed committed to continuing its Large Scale Asset Purchase program (Quantitative Easing or Q.E. ), and deploying specific performance targets, the question of effectiveness looms large. Bernanke has been quite vocal in his testimonies over the last year that monetary stimulus is not a panacea. In his most recently statement, Bernanke specifically stated that "fiscal policy is restraining economic growth." However, the recent improvements in employment and economic activity allowed the FOMC to begin "tapering" their current rate of asset purchases from $85 to $75 billion per month. "…the Committee sees the improvement in economic activity and labor market conditions over that period as consistent with growing underlying strength in the broader economy. In light of the cumulative progress toward maximum employment and the improvement in the outlook for labor market conditions, the Committee decided to modestly reduce the pace of its asset purchases." The problem for the Federal Reserve currently is that there are very few policy tools left, and the economic effectiveness of continued artificial stimulation is clearly waning. Lower mortgages rates, interest rates and excess liquidity served well in priming the pumps of the real estate and financial markets when valuations were extremely depressed. However, four years later, stock valuations are no longer low, earnings are no longer depressed and the majority of real estate related activity has likely been completed. More importantly, the recent surge in leverage and asset prices smacks of an asset bubble in the making. Reminiscent of the choices of Goldilocks – the reality is that the Fed's estimates for economic growth in 2013 was too hot, employment was too cold and inflation estimates were just about right. The real unspoken concern should be the continued threat of deflation and what actions will be available when the next recession eventually comes. nbsp; The Fed's greatest economic fear is deflation and the current drop in annual rates of inflation will keep pressure on the Fed to continue to accommodative policy active for longer than most expect. government? OK. Reveal secret abuses committed by the government? abuse, and you’re on your own. the possibility of further violence. for the protection of the peace officer or other persons present. were seized as evidence or for an additional crime. purchase or otherwise acquire a firearm. hours and during travel to and from work. Late last night, European Union finance ministers agreed on a new system to centralize control of failing euro-zone lenders – a so-called “bank resolution mechanism” – in the hope that it will stop expensive banking crises from ruining the finances of entire countries.As WSJ reports, “”Taxpayers will no longer foot the bill when banks make mistakes and face crises, ending the era of massive bailouts,” according to Michel Barnier, the EU’s internal market commissioner.” Sadly, Mr. Barnier is incorrect, for two main reasons. First, in Europe the link between a bank and its sovereign has never been tighter courtesy of ever rising holdings of host sovereign debt by a bank in question (subsequently repoed with the ECB for cash) currently at recordh high levels across the periphery, which means a major bank failure will always result in taxpayer impairment. Second… well, instead of describing it, we will instead simply show graphically courtesy of the FT just what the “streamlined” bureaucratic process for achieve bank “resolution” in Europe looks like. In a word (or two) – good luck. Overnight we warned that short-to-medium-term money market rates had spiked to record highs (1-Year rate-swaps over 5.06%) and that the PBOC was bravely standing firm on its (lack of) liquidity injections… that didn’t last long. Despite the PBOC’s veiled ongoing attempts to ‘taper’ its own liquidity provisions, as MNI noted, echoes of the June liquidity crunch were heard again in the Chinese money market Thursday and authorities moved to extend trading amid a surge in rates which quiet injections of funding by the People’s Bank of China failed to stem. Jitters in the Chinese interbank market since the PBOC tried to force deleveraging in June highlights the nervousness of an overstretched banking system that is reliant on the central bank’s largesse to ensure stable operations. Trading in the interbank market was extended by a half hour, traders said, citing a notice from the China Foreign Exchange Trade System, something which hasn’t happened since money market rates hit record levels back in June. The PBOC admitted after the close, via its official microblog, that it used Short-term Liquidity Obligations (SLO) to add funding to the market. The bank didn’t specify when it added the funds but, in another direct echo of the June panic, the PBOC said it is prepared to add more. “We will continue to provide liquidity support via SLOs to qualified financial institutions if necessary, depending on the progress of fiscal spending,” the bank said, adding that liquidity conditions are volatile because of seasonal factors. Some traders expect a degree of calm to return once Christmas and the January 1 holiday have passed and liquidity returns to the system. But the Chinese New Year comes soon after that, beginning at the end of the month, and the authorities have signaled they intend to wean China’s notoriously mismatched financial system off its addiction to credit creation over the longer-term, indicating that rates will remain volatile in the weeks and months ahead. It seems clear that the Chinese banks’ PBOC taper tantrum will not allow the central bank to withdraw painlessly. What do People do with Means-Tested Assistance ? There is a ideological caricature of Americans who are aided by public assistance. There claims of fraud and waste are rampant, but the actual evidence is sorely lacking. It is not that there is no fraud or waste, but that it is grossly exaggerated. The caricature tends to be part of a political agenda that wants to reduce the assistance. This Great Graphic was posted on Atlantic by Jordan Weissmann. It shows the consumption patterns of those receiving assistance (red) and those that do not (blue). The data comes from the Bureau of Labor Statistics. 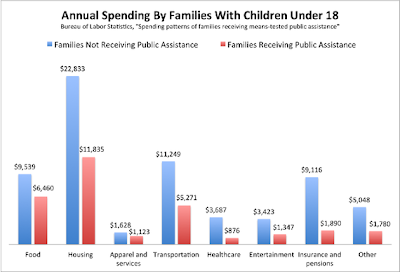 Families receiving assistance spend about half as much as families drawing on assistance. They spend a third less on food, 50% less on housing and 60% less on entertainment. That said, the data does not capture the non-cash assistance that some households receive. Some research (see Henry Farrell’s review of a new study on the Washington Post’s Monkey Cage blog) indicates that people tend to be more supportive of transfer payments and assistance if they believed the recipients are in genuine need and not gaming the system. We suspect, then, that if there was a greater understanding of what the assistance is being spent on, there may be less political resistance to it. Of course, it is not simply a marketing challenge. It is ultimately a political question. How should the social product be divided ? What do social classes owe each other? In that debate, those receiving assistance are often demonized for political and ideological reasons that often bear little relation to the facts. Author adminPosted on December 19, 2013 Categories zerohedgeTags finance, newsLeave a comment on What do People do with Means-Tested Assistance ?